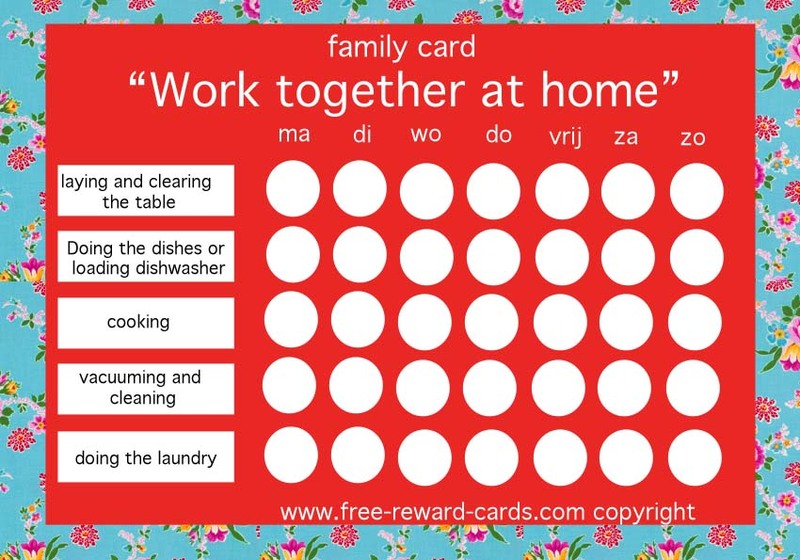 Family Reward Card to stimulate all familymembers to help in the household at home. This chart shows a number of tasks that must be done regularly at home. In the white circle the first letter of the family member can be written who has done the task. Sometimes there are two or more. The challenge is to ensure that all family members approximately equally often put their initials on the card. If this fails you can agree with each other that the one with the most letters will receive a day of pampering from the others ... It's just an idea and I am very curious how this will work! All these reward charts are free printable via www.free-reward-cards.com. The cards are ment to make parenting more fun and easy for both parents and children.